My second foray into the Mamores was on 27th June 2009 one week after Kevin and I had walked the two Western Mamores, Mullach Nan Coireann and Stob Ban. I had intended to walk the eight remaining hills but in the event managed only four. 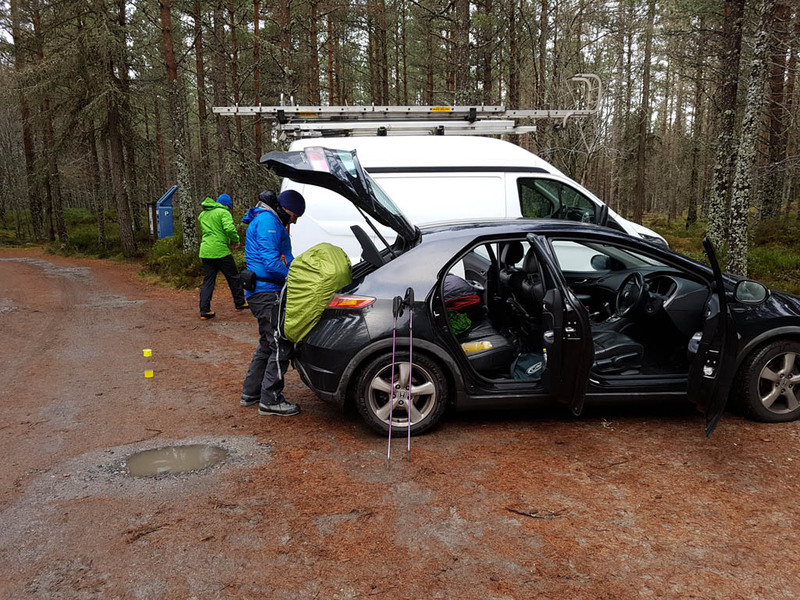 Lots of things wrong that day and lessons were learned which were invaluable during my Munro round that followed. 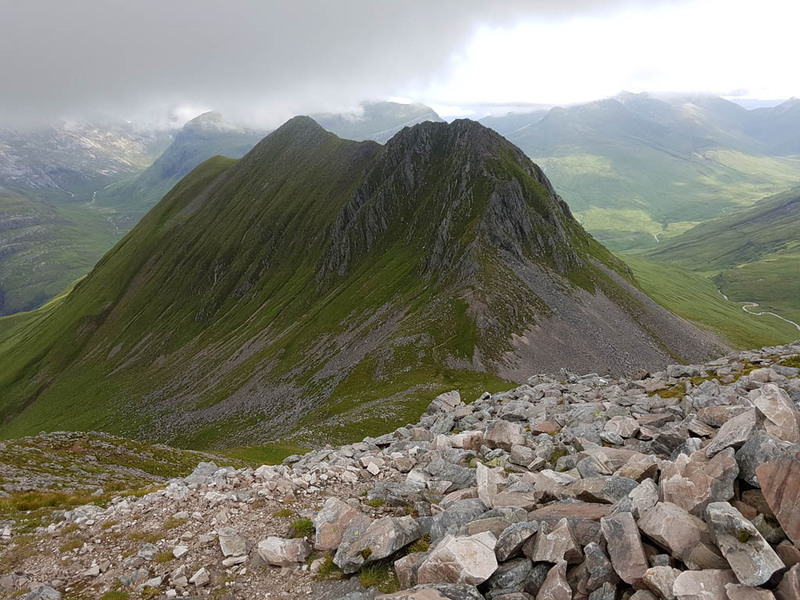 I have visited the Mamores on many occasions since and have viewed them in there splendor from the CMD and Ben Nevis many times and always knew that I would be back to attempt a solo walk over the Ten Munros eventually. Fast forward to Monday 10th July 2017 and I was again in my favorite hills. This was it. The Ten. I had been up here exactly two weeks ago and completed the Six but my preparation at that time was wrong and now I was here to rectify those mistakes. 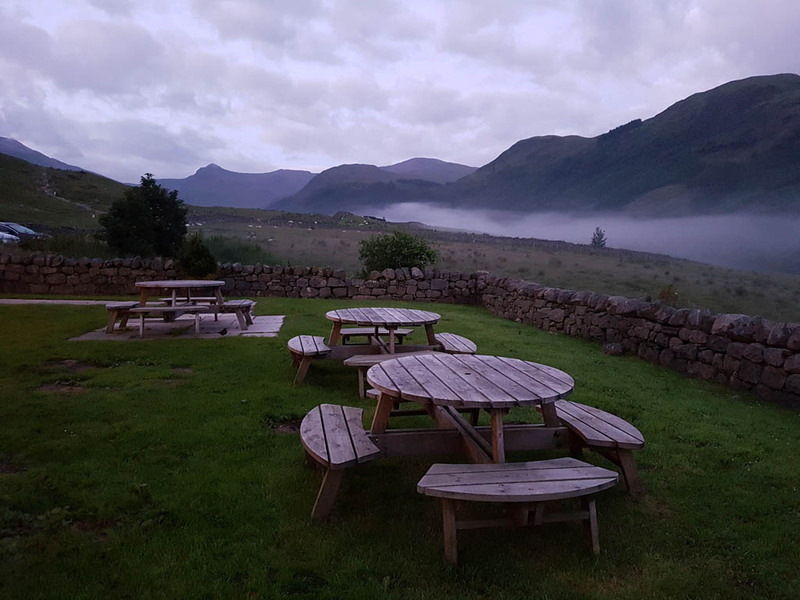 So, I booked a bunk in the Glen Nevis Inn hopeful of getting at least a few hours sleep before an early rise at 0300. However, as the noise doesn’t stop in the Inn above until 2300 and a snorer, enjoying a good night sleep, oblivious to the disruption he/she is causing hahaha, only a few yards away I would not be exaggerating to say I barely slept at all. I had set the alarm for 0300 but switched it off and arose at around 0345. After a nice cup of hot coffee, my only hot drink for the rest of the day, and a small flapjack for breakfast I set off for the car parking area at Polldubh arriving there at approximately 0425. I was soon on my way up to the small track in the Forrest signposted, the Munros. It had been raining for the last few days/week and there was a lot of water around. The walk up through the forest track was lovely and the forecast had predicted a sunny/slightly overcast day until some rain around 1600. That will do nicely thank you. There is a lovely waterfall and a water slide to my left where the water was cascading down. A great place for a wee family walk. In no time at all I was joining the main forest track turning right and following it the track for approx 600m, ignoring the bend uphill which I took two weeks ago which then involved an uphill pathless steep fight. There is now a nice wee staircase of wood/stones heading into the hillside. This changes to a small track leading to a Style across the deer fence. Immediately turning left after the style there is a track, boggy in places, all the way to Mullach Nan Coireann. Interestingly enough I arrived at this summit 20 minutes quicker than I did 2 weeks ago arriving at the summit at 0550 and feeling much less tired haha. The uphill section I took on that occasion would be described as Fight in orienteering terms. A short section maybe but Fight none the less. 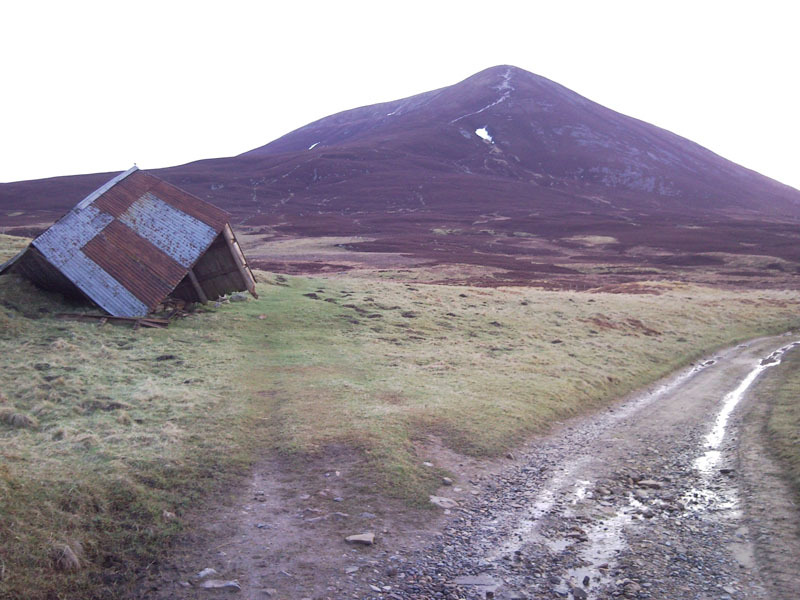 Its now an easy two kilometer walk to Stob Ban. 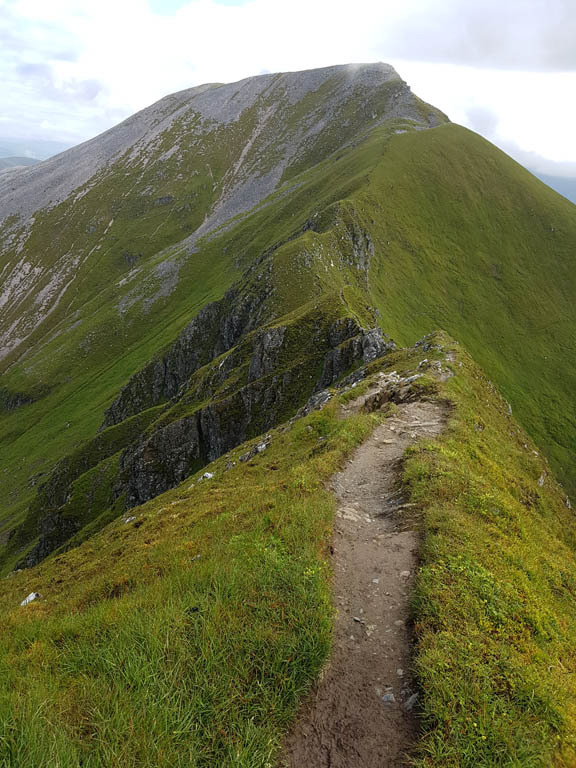 An impressive Munro from any angle. I had packed 1.75 litres of fluid with me in two bottles with each of the bottles containing a solution of High5 Sports Nutrition Electrolyte drink with Whey Protein. I was using this mixture for the second time. I had used it two weeks ago and it seemed to agree with me and staved off any cramp which I am prone to getting during these events. However, I also brought a bottle of water last time and this time to save weight I did not. The result was that as I was drinking I was taking in too much electrolyte which didn’t do me any good later on. At the moment I was flying high and feeling good. I took the first of my energy gels on Stob Ban. This was another bright idea of mine in order to save weight and take in only those foods essential for muscle replenishment and energy. This seemed to work a treat and I would recommend it to others. I consumed 5 energy gels during the walk along with 6 mini pork pies, an apple, a banana, two packets of crisps and two bars of chocolate. 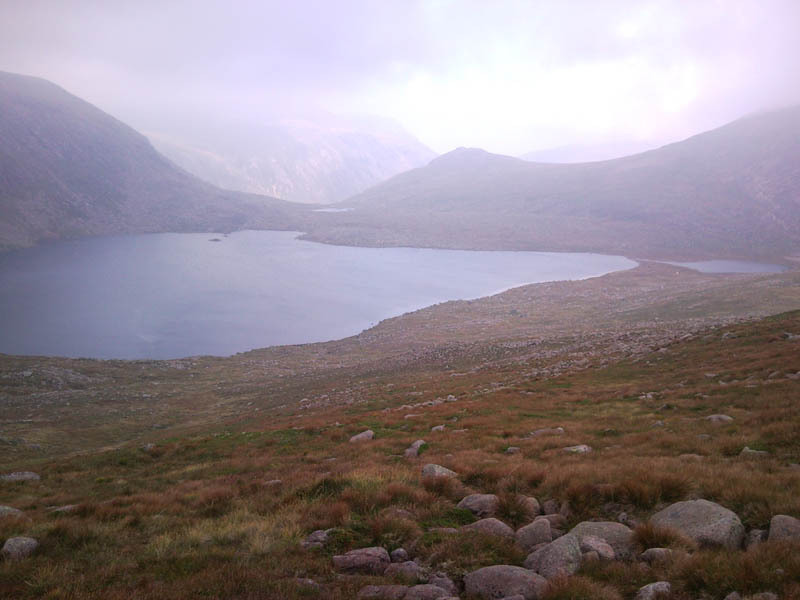 So following the good path for a further 1.5km I arrived at the Lochan below Sgurr and Lubhair. It was full of water with the recent rains and the burn was a great place to replenish my fluids. Again I added electrolyte powder to my water. This mixture has to last me until I reach the Lochan below Sgurr Eilde Mor. 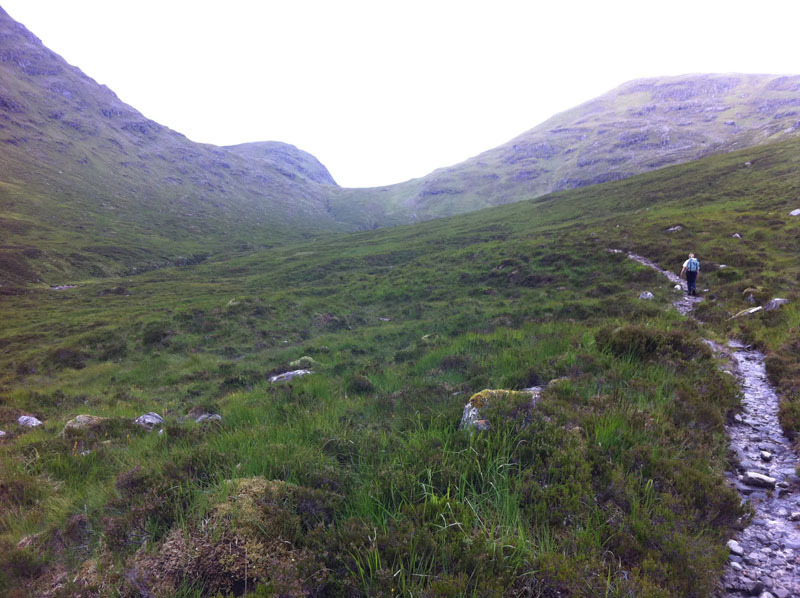 So onwards up the zigzag track And up and down the Devils Ridge for 1.5km to the summit of Sgurr a Mhaim. The clag had come down now it was 0810. I was 40 minutes faster to this point than two weeks ago so I was making good time. My only hope was that I wasn’t working too hard but time would tell. I again head over the Devils Ridge and up over Sgurr and Lubhair and on to Am Bodach. 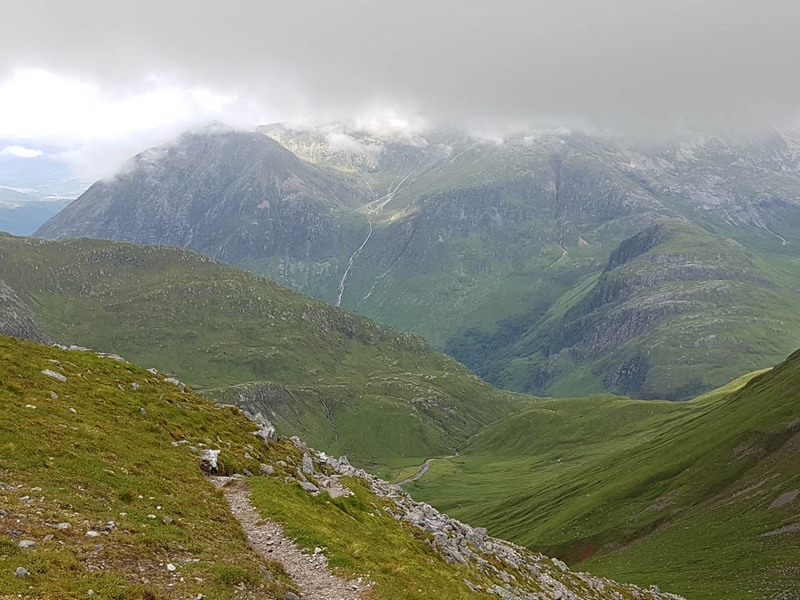 The ascent to Am Bodach is much easier from this direction and I am soon on the summit and feeling good. The weather has been ideal so long may it continue. Its 0928. A hop skip and a jump onto the next Munro Stob Coire a Chairn arriving at 1000. 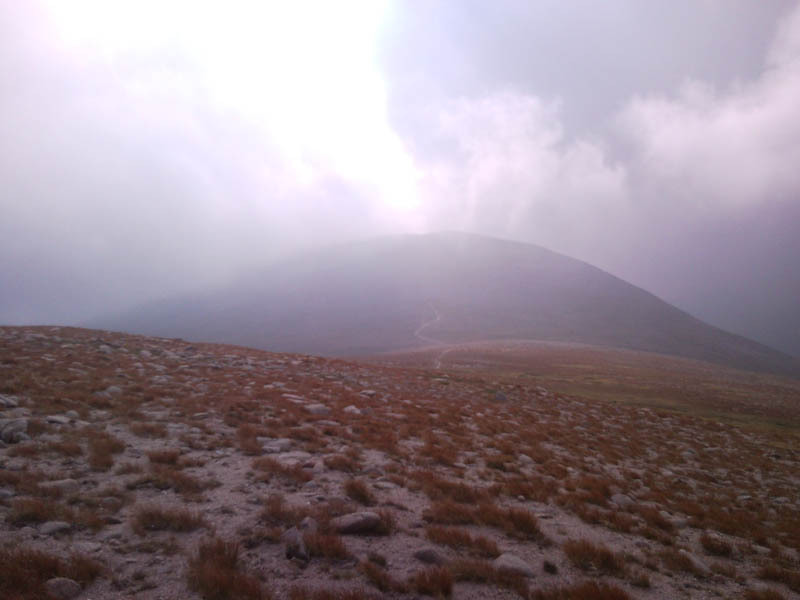 This seemingly simple hump is a Munro, no honest it is hahaha. I take my second energy gel and eat two mini pork pies and a banana.There are great views all around. The spine up to Am Gabrahanich is very impressive and I continue on my way down to the Beallach. I decide to leave my backpack here and return after bagging An Gearanach. This isn’t something I like doing but I know its a energy sapping ascent and knee jerking return. 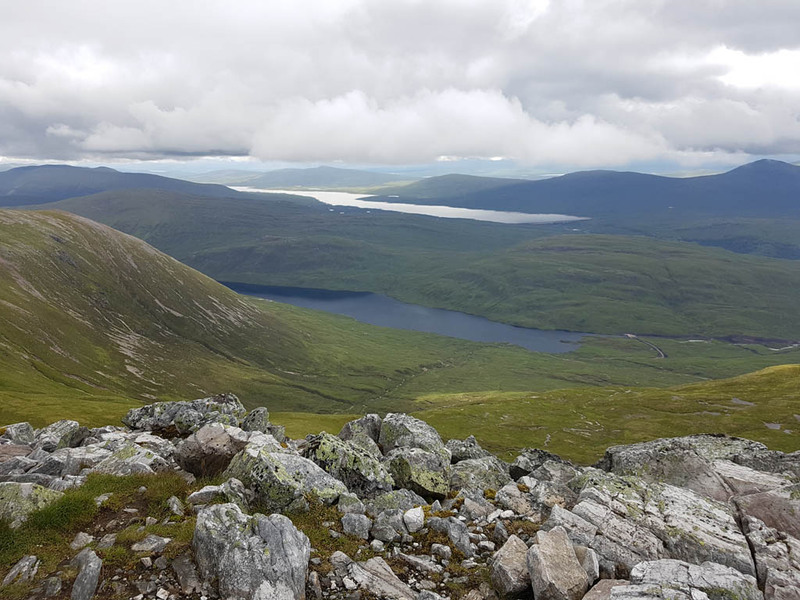 I had spied three walkers on the summit of An Gearanach walking in my direction so I knew that if I was in trouble support was not very far away. 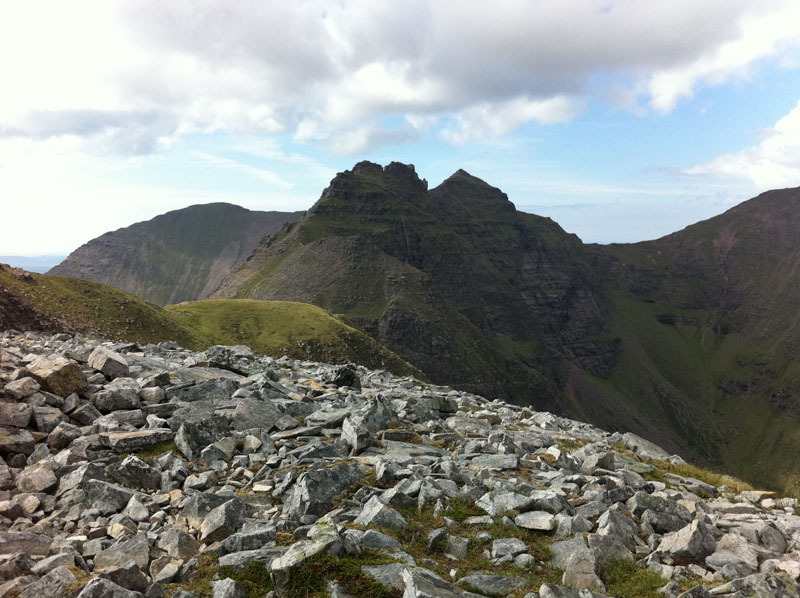 I arrived at An Gearanach at 1046 and immediately returned to the Beallach and retrieved my backpack. I was pleased with bagging the first 6 Munros in 6 and a half hours. I had made good time and a finish in around 13 hours was now possible. From the Beallach I took a simple traverse to join the South East ridge of Stob Coire a Chairn heading for Na Gruagachean. I was feeling a bit funny and was supping my electrolite drink but not really enjoying it anymore. I wanted some clean water but there was none to be had at the moment. The rocky slope up to the Munro was quite hard work now and I knew I was slowing down. I was starting to feel a little sick and had a couple of wretches. However onwards and upwards is the Munro baggers mantra and i was soon on the summit on Na Gruachean. This has to be one of the best summits in the Mamores. 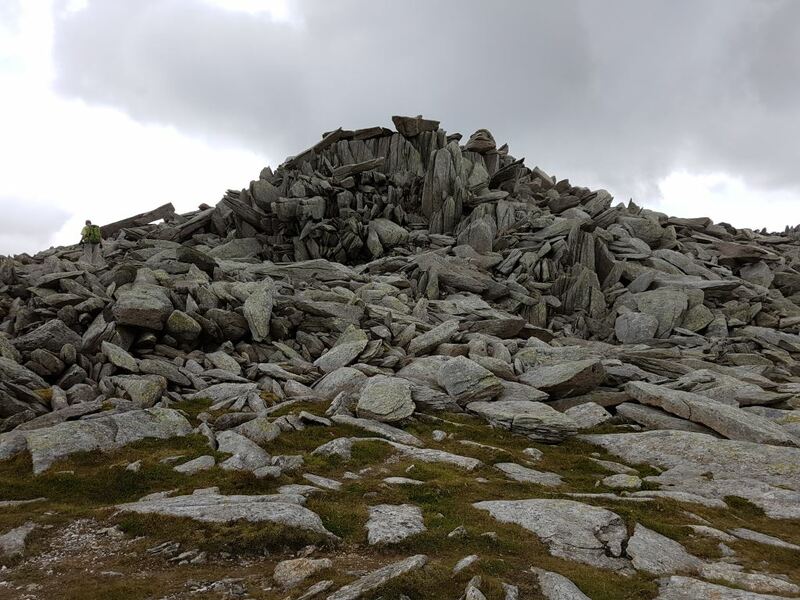 A small rocky craggy top perched on a giant mountain top. I reflect on my first visit here in 2009 and at that time with my big pack I headed down the steeeeeep West side of the mountain to join the lower path. I remember nearly having vertigo at the time…..No wonder hahaha. Its now 1205. I need water but I will have to wait. I don’t drink anymore electrolite solution. 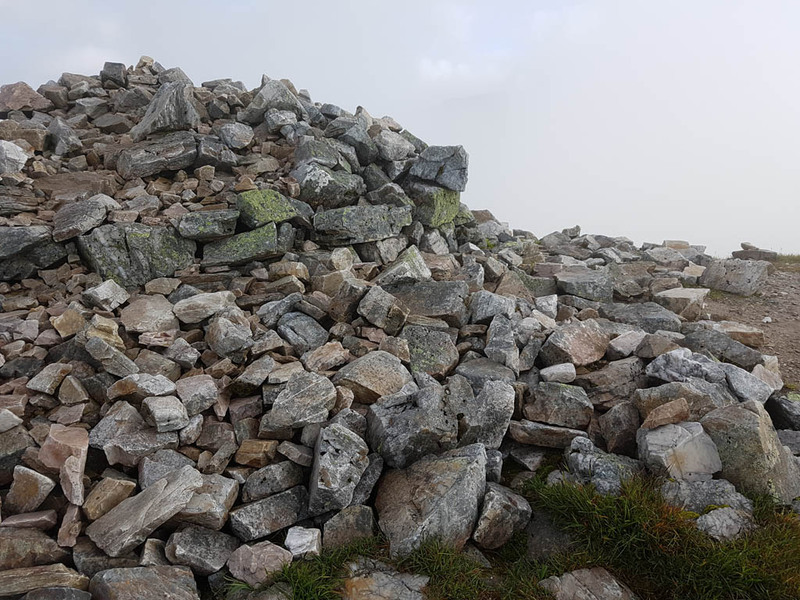 I am pleased with progress and I now head along the North East ridge in the direction of the 1062m spot height and onto Binnein Mor at 1130m the highest Munro on the round. As I approach the spot height something strange happens. I start to sweat profusely. I am not working particularly hard but sweat starts pouring out of me. I was certainly hydrated as I could tell by the color of my pee. (thats not rude btw. Its just a good indication of condition ). I think my body is trying to get rid of all this sodium i have forced into it. 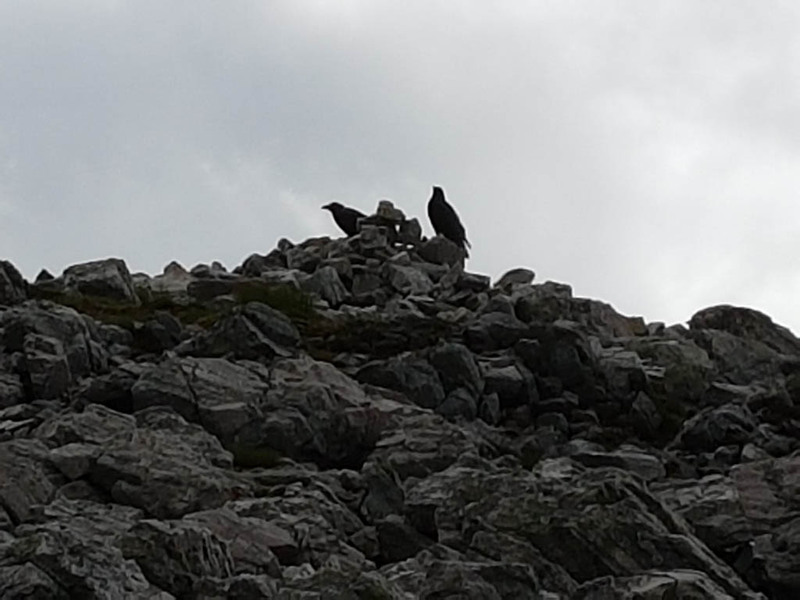 I could see a large group approaching the ridge up to the spot height and I continued on my way. It took me an hour from Na Gruagaichean to the summit of Binnein Mor. And without further ado I head back to the spot height and turn South East down the ridge to the cairn approximately 500m later which indicates the path down into the Glen. I head down the path and in no time find a good stream pouring out the hillside. I drink loads of fresh water and fill one of my water bottles. That feels so good. The rain now starts and after umming and aahhhing it pelts it down for the rest of the walk. In no time I am at the base of Sgurr Eilde Mor taking the track that meanders up the North West face. The track is very stony initially and there have been some rock falls which have covered it up in places. It then changes to a red scree/dusty steep ascent which with the addition of the rain is very slippy. 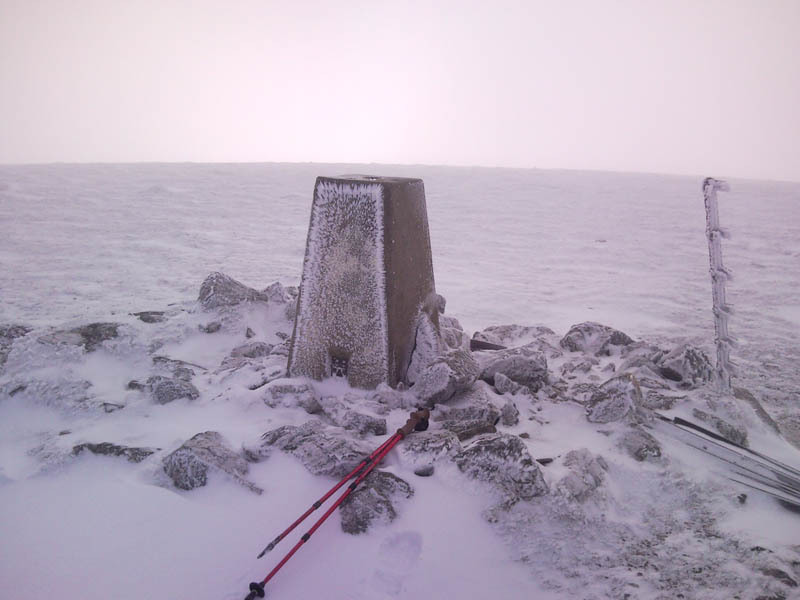 However with my trusty poles and my Merrel boots I am soon on the summit. I have been texting my nephew but I have not had a signal this side of the hills so I hope he doesn’t call out MR hahaha. 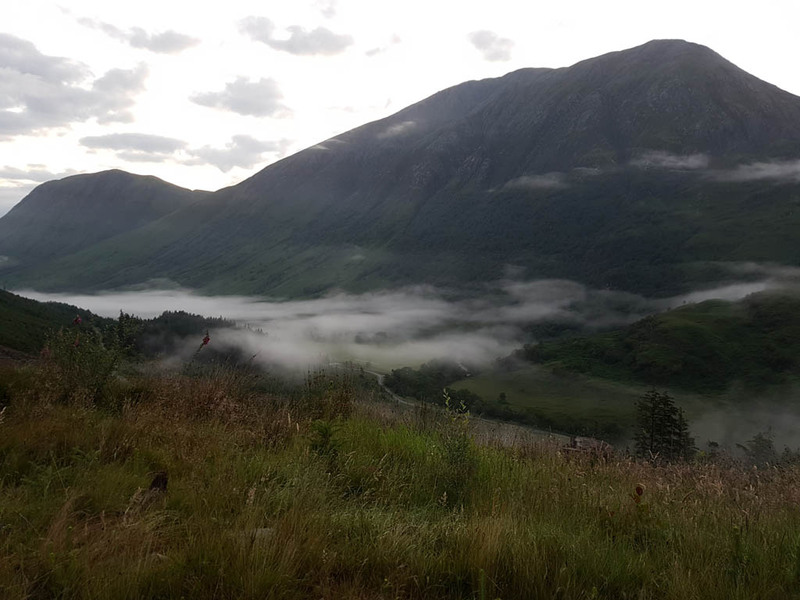 Its now 1425 and I have one Munro left to complete the round, not forgetting of course the horrible walk out of Glen Nevis. I scree surf down the track and then head down the hillside directly to join the track to Binnein Beag. Its all uphill but its not steep until the last 200m. I am feeling good now and find this easy enough arriving at the summit at 1545. I don’t hang about and head directly down the North West face. Its a little bit steep initially but then shallows to a gentle slope far more gentle than I remember. I head down to the large bend in the river and cross easily before the bogfest walkout along the Water of Nevis. After a while and passing many campers pitched in the bog I meet a better track which takes me past Steall falls through the gully and onto the upper car park. Its been 13hrs and 15 minutes to this point. Its simply a quick 30 minute walk back to Polldubh and I am racing along.